That's us, four years ago, meeting little owlet for the first time... in the dining room. I am aware that homebirth will happen in my lounge room imminently. I am aware that homebirth is an amazing, life changing, completely normal, everyday miracle kind of thing. I am aware that I am extremely lucky to have a home to birth in. I am aware that many women around the world do not have the same luxury I do. The best they can hope for is to avoid trauma and infection and that someone might get them a glass of water or gently rub their back*. I am aware that I am lucky to have a care provider who will just be with me and leave me to birth in my own time. I am aware that my right to have the birth that I want, with the care provider I want, is on tenterhooks. I am aware that the medical and political powers that be have put insurance before autonomy and seek to make homebirth, as I know it, illegal. I am aware that they are doing this not just in Australia, but in Ireland and Germany right now too. I am aware of my responsibilities as a birthing woman and parent and I am aware of the perceived risks. I am aware that the risks are not as the media, medical factions and insurance companies would have us believe. I am aware that I am part of a minority who cares about this stuff and worries that my daughters may not have the same experience of birth that they have come to see as normal. I am aware that my best chance of avoiding intervention is to stay at home. I am aware that when I birth at home, the only time we look at a clock is to record the time of birth... after we've all taken a moment. 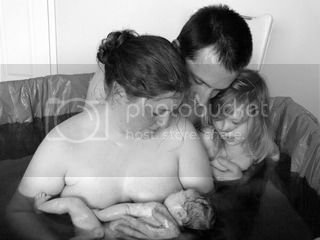 I am aware that homebirth allows for a smooth transition for my family from a family of four, to a family of five. I am aware that homebirth is best for me and my baby. I am not brave. I am not a hippie. I am not built for birthing more than any other woman. But I am aware. oh gosh that almost made me cry, I say almost because tears havent made it down my cheek, yet. I have been reading a book about a Dr in Sudan and stories of how women are being treated there, let alone birthing women, makes me feel sick to my stomach. Even though it is every womans right to birth where she chooses I do feel lucky to not live in a country that sees even more human rights abuse. It does not mean that we should accept the current situation in our country though. I love that photo, is it the same one you posted on JB way back when? I am sure I remember it, it really stood out to me then. Tears here, too - on so many levels, both good & bad. I think it's a great choice - natural and sound and best for every member of the family; and I also think that it should be a choice that's available to all Australian women. In retrospect I would have loved to have birthed my children at home, especially the second as I felt that being in hospital was like a wedge between me and my 'big girl' who was all of two and a half. My births were traumatic and characterised by spiralling medical intervention. A beautiful picture of you all in the pool - what strikes me the most is how wonderful it must have been for your big owlet to be a part of it all. Thanks for your thoughts, Leni. My first birth was in a hospital too. It was indeed a very special moment meeting big owlet for the first time, but unfortunately was hindered by hospital policy. I'm really glad for you that your hospital births were so special, but unless you have tried the alternative, its a little hard to compare, I expect. Unfortunately for me, my choice is under a huge amount of threat due to a legislation that will come into effect in this country in a couple of days. This is an issue for all women as many will never get to make that choice, it will be made for them. I have yet to meet a single woman who has actually experienced both home and hospital and thinks hospital is better. Hundreds of women who have experienced both thought home was better. No, it isn't a competition. It's not even close. I'm glad you are so very aware of the real danger and difficulty that many women around the world experience in their birthing (in my calm-birthing readings, I've come across some glorification of birth in certain non-industrialised countries which are really quite untrue!). I've ummed and ahhed about the home birthing thing for no3. I've had two very good natural births in hospitals, although that's kind of been in spite of the hospital systems themselves (good midwives though!). Also because Jus is a doctor, but also on board with my hypno-birthing strategies, he's a wonderful guard-dog and has just kept all interventionist approaches away from me with great command and confidence. Still, hmmm, homebirth. Must go and google the Melbourne options. Don't we easily forget how others are forced to live and endure. Thank you for sharing and reminding us.